If you made it out to Chicago Code Camp 2016 then I don’t have to tell you that it was an AWESOME day! It may have been rainy and cold outside, but inside it was action packed and full of surprises. 2 of our local community members brought their HoloLens devices, and I even got to try one out. A friend of mine even shot a short video of my keynote, including the proverbial “elephant in the room” – Imposter Syndrome. I saw lots of friendly faces from years past, made some new connections, and had a lot of really great conversations in the halls, at the booth, and even via Twitter. 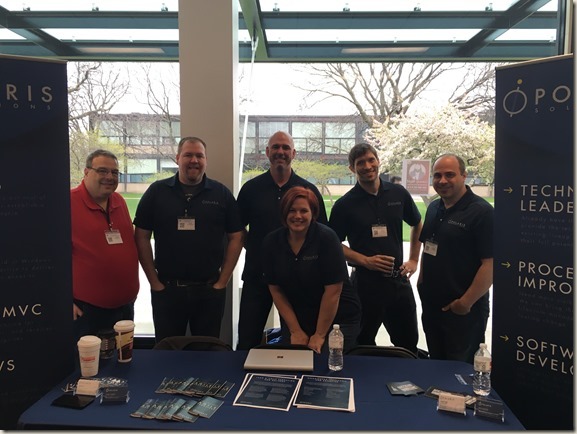 Polaris is proud to support a great conference like Chicago Code Camp, and it was great to have the opportunity to chat with so many awesome local technologists! Whether or not you realize it, we really do enjoy when people stop by the Polaris Solutions booth to chat with us, allowing us to share our experiences and maybe even do a bit of quick problem solving! So thank you for making our day that much more fun. If you didn’t quite have enough time to ask us your burning questions, or if you thought of something you’d like to ask us about our company, job openings, or consulting services, please drop me a line any time. I also wanted to say thank you to everyone who made the day a great one – the attended, speakers, volunteers, organizers, and all of the other sponsors too. *Alas when we took this I couldn’t track down Zaneta, maybe someone could Photoshop her in here! Hope to see you at next year’s Chicago Code Conference!